United Nations Secretary-General Ban Ki-moon was on Sunday given the title of ‘Tupua’ or ‘chief’ in south-eastern Samoa by villagers whose homes had been struck by a tsunami nearly five years ago. 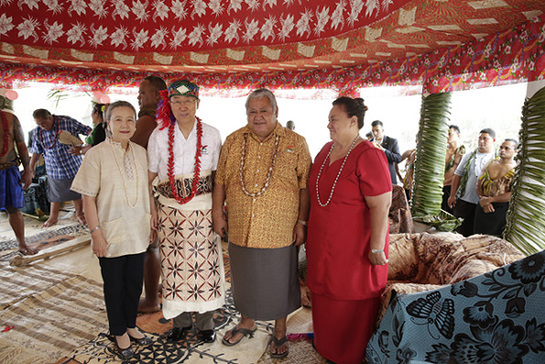 Wearing traditional ‘siapo lavalava’ around his waist and a beaded ‘palefuiono’ with feathers on his head, the Secretary-General sat across from Prime Minister Tuilaepa Aiono Sailele Malielegaoi in a roofed social centre in Siupapa, a sub-village of Saleapaga. “It has been agreed by consensus that you be confirmed with the title of Tupua,” the Prime Minister said following a traditional ’ava drinking ceremony. Surrounded by more than a dozen chiefs from local families, as well as the Speaker of the Parliament, Afioga Hon Laauli Leuatea Polataivao Fosi Schmidt, and other senior officials, the Prime Minister said the Secretary-General will be addressed as “Your Excellency Prince Tupua Ban Ki-moon of Siupapa Saleapaga.” An elderly woman in the village confirmed that the holding of such an already rare ceremony has never before occurred in the village on a Sunday. 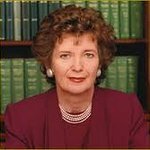 Seated nearby were Mr. Ban’s own chiefs, of sort, including his Special Envoy for Climate Change, Mary Robinson, and Valerie Amos, the Under-Secretary-General for Humanitarian Affairs and Emergency Relief Coordinator. Also joining him was Wu Hongbo, who serves as Secretary-General of the UN Conference on Small Island Developing States, which is due to begin tomorrow in the capital, Apia. Among the topics that will be discussed at the summit over the next four days are adapting to and mitigating climate change, building resilience, and sustainable management of oceans. These are important topics for the communities in Saleapaga, which on 29 September 2009 braced an 8.1 magnitude earthquake that caused sea levels to rise up to 46 feet, according to official measures. Lafi Lesa was working in Apia when she heard the news and drove back that morning. There were at least 189 people killed that day, including five from her family. After the tsunami, the community moved to its farmland, a 50-minute walk uphill. Instead of fishing, they grow bananas and taro, and raise cattle. The Government has since installed sirens to warn of a potential disaster, and people are educated in how to evacuate quickly. People still go to the beach to enjoy the sun, but the cement foundations of many houses remain desolate under coconut trees, some which are still broken years later. “People want to go back because there was easy access to roads and to operate their small businesses. Up here, because it’s more or less farmland, it is hard for them, and they can hardly adapt to changes,” said Ms. Lesa. Despite having a 25-year-old daughter who works in a bank in the capital, Ms. Lesa decided to remain on the coast after the tsunami. She has a small shop and also represents her family in the village council. With only one road to the village, however, and few opportunities for education and alternative livelihoods, she worries about the future of her community. Ms. Lesa said that she was overwhelmed by the number of delegates participating in the conference, and she hopes that their decisions this week will lead to real action.